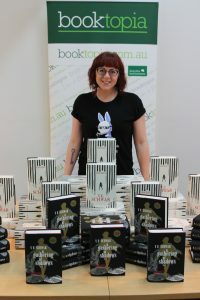 This week, Booktopia played host to the wonderful Victoria ‘V.E.’ Schwab, who is currently touring Australia. The author of books such as the Shades of Magic trilogy, the Villains duology, the City of Ghosts series and more, Victoria is a veritable legend in the realm of fantasy and sci-fi for readers of all ages (including many members of Booktopia’s own staff)! Victoria came in to sign some copies of her books A Gathering of Shadows (the second book in the Shades of Magic trilogy, available now in a brand new collector’s edition to match the first book) and Vengeful, the sequel to Vicious. Booktopia’s Kids and YA specialist Sarah McDuling and myself then sat down with Victoria to have a chat about anything and everything writing-related, resulting in one of the most fascinating discussions we’ve ever had. Like many authors, Victoria wanted to write books that she herself wanted to read, which resulted in her first book, The Near Witch. First released in 2011, it’s a quiet, dark, and beautifully bewitching book that is now being re-published. Funnily enough, it’s this approach to seeing a potential readership in more singular, personal terms that has earned Victoria such a large, diverse, and devoted fanbase. She has an innate ability to seek out the inner misfit in every reader and tell them an absolutely magical story, thanks to her masterful ability to build the world of a story. From Vicious to A Darker Shade of Magic, Victoria’s books are all so intricately detailed, vivid, and real. “I try very hard to treat setting as character… I’m a very cinematic thinker.” she says. This is the product of almost meticulous planning, which gives her the freedom to “wander” within the realm of a story, but to always keep an end goal in sight. Given that the Villains duology has drawn to a close with the release of Vengeful, we naturally couldn’t help but ask what was next on the cards. Victoria told us all about her upcoming book The Invisible Life of Addie La Rue, a devilish-sounding book that’s been brewing for nearly eight years. You’re going to want to listen to the podcast just to hear Victoria describe it, because she gave both Sarah and myself goosebumps – we absolutely cannot wait to read it. And don’t forget, you can get signed copies of Vengeful and the Collector’s Edition of A Gathering of Shadows right now! Be quick, though – stock is extremely limited! You can also check out the rest of V.E. Schwab’s books right here. 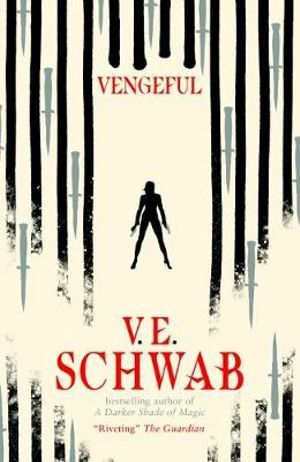 A super-powered battle of genius, cruelty, and the lengths one will go for vengeance - V. E. Schwab returns with the end to the Villains duology. Sydney Clarke once had Serena-beloved sister, betrayed enemy, powerful ally. But now she's alone, except for her thrice-dead dog, Dol. And then there's Victor, who thinks Sydney doesn't know about his most recent act of vengeance. Victor himself is under the radar these days-being buried and re-animated can strike concern even if one has superhuman powers. But despite his own worries, his anger remains. And Eli Ever still has yet to pay for the evil he has done. previous postSee the Man Booker International Shortlist! next postThe ABIA Shortlists are here!